This Charming Country Home has 3 Bedrooms, 2 Baths, With a Large Master Suite Upstairs. 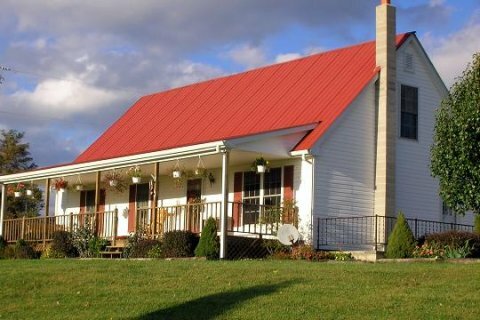 Located on 40.37 Beautiful Acres in Floyd County, Virginia. Picturesque Farm! Best View of Buffalo Mountain in the County! 3,058 Feet Elevation. Charming country home with privacy, built 1999, full custom remodel in 2005. Italian Walnut laminate floor, large master suite upstairs with an office and large bath with 2-person heated Jacuzzi & a custom built tiled shower with glass blocks. Large walk-in closets with shelving for each of the three bedrooms. All Windows are insulated, Tilt-In with enclosed trim. The unfinished basement is already heated, plumbed, and framed for three rooms. Laundry in the basement. Additional washer & dryer connections are installed on the main level in the pantry. Covered front porch, back deck, metal roof. 3,238 square feet horse barn with 6 stalls, electricity, water, shop, tack room, chicken pen, storage for hay & tractor. Additional old barn for storage. 2 horse riding rings. Rolling hayfields & woods, fenced and cross-fenced into 5 sections. Stream & springs. FAA approved plan for an airstrip. Surveyed into 3 tracts. 3 driveways and long frontage on Conner Grove Road. Additional old 2-story farmhouse in the woods next to the creek (poor condition/no value). Garage building with a workshop/tool room. Old smokehouse. Additional cleared lot just north of the house with water & septic lines, perfect for adding a detached garage or relatives or friends visiting in a RV. Driveway lined with Bradford Pear trees. Potential for a 2+ acre lake along the northern creek/springs, and a good site for a fishing or swimming pond on the back side of the farm with lots of privacy. Abundance of deer, wild turkeys, and other wildlife. The hayfields produce approximately 1,000 bales of hay at summer cutting. We previously had horses, goats, chickens, ducks, turkeys, and honey bees. New Holland TN-70 Tractor w/ cab, heat, a/c, stereo, backhoe, frontend loader, bush hog, scrape blade, haybine, tedder, rake, and square baler can be purchased at closing. The home could have 2,674 square feet of living space if the basement was finished. See the Current Weather on the Farm.